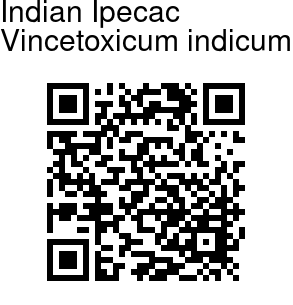 Indian Ipecac is a small, slender, much branched, velvety, twining or climbing herb with yellowish sap. It is mostly found in the sub-himalayan tract from Uttarakhand to Meghalaya and in the central and peninsular India. Rootstock is 2.5-5 cm, thick. Leaves, 6-11 cm long, 3.8-6 cm wide, are ovate-oblong to elliptic-oblong, with a narrow tip, heart-shaped at base, thick, velvety beneath when young, smooth above. Leaf stalks are up to 1.2 cm long. Flowers are small, 1-1.5 cm across, in 2 to 3-flowered fascicles in cymes in leaf axils. Sepal tube is divided nearly to the base, densely hairy outside. Sepals are lanceshaped. 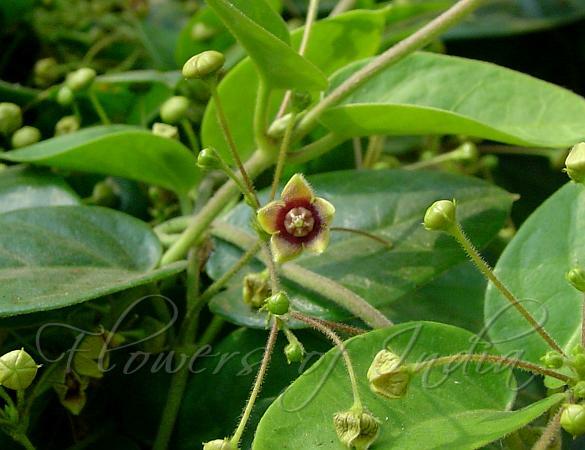 Flowers are greenish- yellow or greenish-purple, with oblong pointy petals. Fruit is a follicle, up to 7 x 1 cm, ovoid-lanceshaped. Flowering: August-December. Identification credit: Prashant Awale Photographed in Mumbai & Agumbe, Karnataka..